Hi Jesse,I will give you a report as soon as I can. 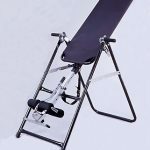 I have purchased the inversion table. What a difference to my right leg pain. I also reviewed the CD’s and DVD’s. Your exercise for sciatica has made a big improvement. I'm able to walk much better. I would get pain down my right leg so bad that I couldn't walk. Sometimes I would have to use crutches. Click here to learn more about the product he used to get lasting relief.